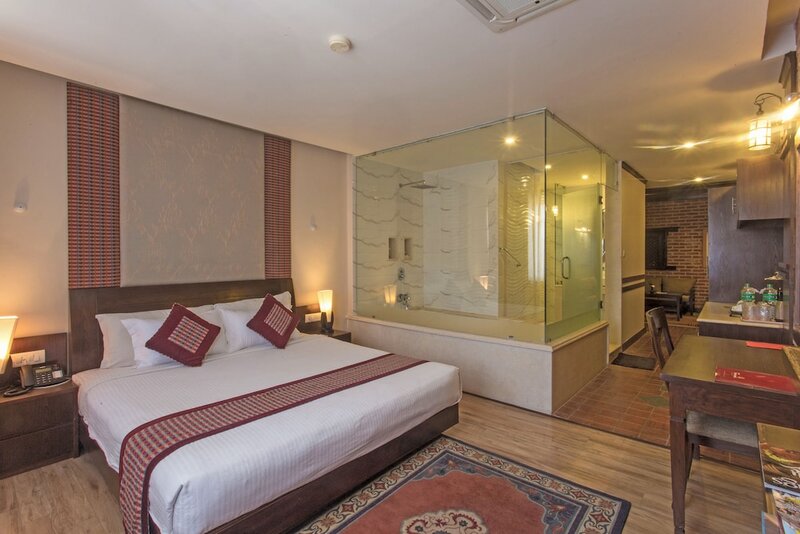 Located in Thamel, this spa hotel is within 1 mi (2 km) of Durbar Marg, Garden of Dreams, and Kathmandu Durbar Square. Pashupatinath Temple is 2.7 mi (4.3 km) away. A restaurant, a bar/lounge, and a coffee shop/café are available at this hotel. Free WiFi in public areas and free valet parking are also provided. Other amenities include a 24-hour business center, a conference center, and massage/treatment rooms. All 95 individually decorated rooms feature free WiFi and 24-hour room service. For a bit of entertainment, LCD TVs come with satellite channels, and guests will also appreciate thoughtful touches like bathrobes and slippers. This 3-star property offers access to a 24-hour business center. 2 meeting rooms are available. This business-friendly hotel also offers spa services, a library, and a terrace. For a surcharge, a shuttle from the hotel to the airport (available 24 hours) is offered to guests. Limited complimentary onsite parking is available on a first-come, first-served basis. Palace Restaurant - This restaurant specializes in local cuisine and serves breakfast, lunch, and dinner. Cozy Garden - Overlooking the garden, this café serves breakfast, lunch, and dinner. Guests can order drinks at the bar and enjoy alfresco dining (weather permitting). Lumbini Cafe - This coffee shop specializes in Asian cuisine and serves breakfast, lunch, and dinner. The Khukuri Bar - This bar specializes in local cuisine. This property offers transfers from the airport (surcharges may apply). Guests must contact the property with arrival details 72 hours prior to arrival, using the contact information on the booking confirmation. Reservations are required for massage services. Reservations can be made by contacting the hotel prior to arrival, using the contact information on the booking confirmation. No pets and no service animals are allowed at this property.